Emotional literacy skills – the ability to “read” (recognize) feelings in other people, the ability to read your own feelings (notice your internal cues), and to express your feelings appropriately are all incredibly important to your child’s long-term success. Talk about emotions when you see them in books and videos, when the child is not experiencing those emotions. Once they’ve grasped what the word “sad” is, it may be easier to talk about things like “what makes people sad”, “how can you tell when someone is sad”, and “what makes someone feel better when they’re sad” when your child is not feeling sad. I’ve written before about the Anatomy of a Tantrum. and how to time your intervention. In The Incredible Years, Webster-Stratton talks about stages in the build-up of tension: first the child is grouchy or sulking, then becomes more tense and moody. That can escalate to an explosive outburst, followed by the depression / “leave me alone” stage, then your child may resume normal activities as if nothing had happened. Ideally, we want our children to notice their own cues that their emotions are starting to escalate. We want them to be able to catch themselves in that first stage, and talk themselves down. That won’t happen when they’re two or three years old. But if we talk to them about self-soothing, and model emotional regulation, they’ll get there sooner than if we don’t talk about it! Be concrete when talking about what cues tell us we’re feeling an emotion or what cues tell us how others are feeling. When you’re feeling emotional, describe your internal feelings. Talk about body language and what it conveys about how someone is feeling. There are some useful examples here and here. In your pretend play, or in puppet shows, model a range of emotional expressions and coping strategies. 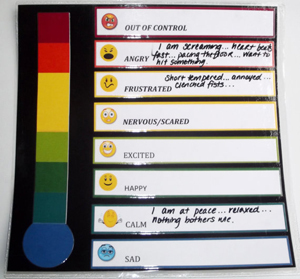 A helpful tool can be to create an emotional thermometer for your child. 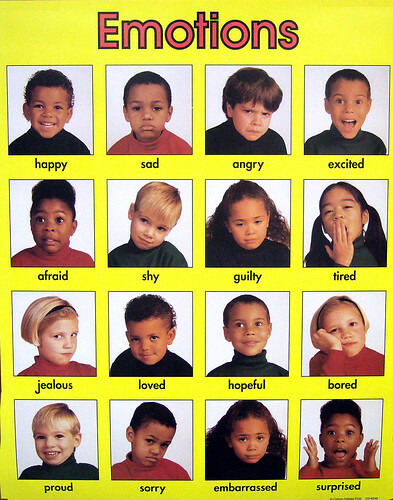 (If you search for “emotions thermometer for kids” you’ll find multiple examples.) On the “cold” end, it has sad. Then in the area where you would find moderate temperatures, it has calm, then happy, and so on. Then in the high temperature range you have different levels of anger. Once you’ve explained it to your child, they can use it to show you how they’re feeling today, and what they could do to “cool down” or “warm up.” You may recommend that if they reach a certain high temperature, they should remove themselves from the situation for a time out to cool down. A thermometer may work best for kids who are 5 or older, or 4 year olds who have a grasp of numbers and measurement. For 2 and 3 year olds, it may be better to use your hands to show how big a feeling is. Hold your thumb and finger close together to show an “itty bitty” emotion or hold your hands far apart to show a great big feeling. Note: many of the ideas discussed here are from “Dinosaur School” a part of the Incredible Years program. Read more here about: Emotional Literacy and Emotion Coaching. This entry was posted in Emotional / Social and tagged emotion coaching, emotions, Tantrum on October 27, 2017 by Janelle Durham.